Two-time U.S. Champion Evan Lysacek is the 2009 Four Continents Championship silver medalist after a dynamic free skate that included a solid quadruple toe. Skating in the same arena that will be used for the 2010 Olympic Winter Games in Vancouver, Canada, Lysacek finished with a personal best 237.15 points. He far surpassed the marks that helped him to bronze at Skate America, Skate Canada and the U.S. Championships earlier this season. Canada’s Patrick Chan (249.19) took the championship while Japan’s Takahiko Kozuka captured the bronze medal (221.76) ahead of country mate Nobunari Oda (220.26). Kozuka topped Lysacek earlier this season at Skate America. 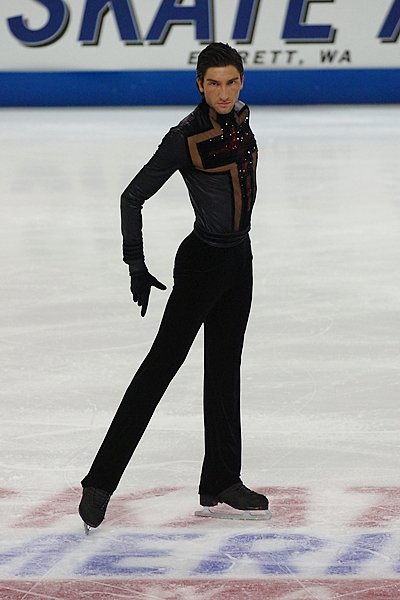 U.S. Champion Jeremy Abbott, the gold medalist at the Grand Prix Final, settled for fifth place with a score of 216.94. National silver medalist Brandon Mroz (196.78) dropped to eighth overall following a ninth place free skate. Lysacek’s performance to “Rhapsody in Blue” opened with a solid quad toe, which received a positive grade of execution. He encountered the only problem of his program on the next element, a solo triple axel. It was downgraded and received a negative grade of execution. But the two-time World Championship bronze medalist recovered nicely to land a triple Salchow and a triple axel-triple toe combination, with no problems on the axel. Lysacek landed a triple loop, triple flip-double toe-double loop, triple lutz and triple flip. All three of his spins were a Level 4 while both of his step sequences were judged as a Level 3. In Abbott’s free skate, he started by doubling an intended quadruple toe loop. He also landed a triple flip, triple axel, triple Salchow and triple axel-triple toe combination before falling on his triple lutz for the second time in the competition. Abbott recovered from the fall with a triple loop-double toe-double loop and a double axel-double toe. 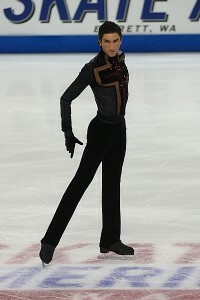 Among the highlights of his program, he had two Level 4 spins and three elements that received a Level 3. Mroz landed a quad toe to start his free skate. But he was not able to overcome problems on his two triple axels, which were downgraded to doubles, and the edge deduction on the first jump in his triple flip-double toe-double loop combination. All three of the American representatives in Vancouver will move on to the World Championships, slated for March 22-29 in Los Angeles, the adoptive hometown of Lysacek. The men were named to the World team based on their 1-2-3 finish at the U.S. Championships in Cleveland, Ohio. Other Figure Skaters Online athletes moving on to the World competition include U.S. Champion Alissa Czisny and silver medalist Rachael Flatt. Del Mar, Calif., native Flatt qualified for the 2008 Worlds but did not meet the minimum age requirement to compete. Two-time U.S. Champions Keauna McLaughlin and Rockne Brubaker are also competing in Los Angeles after missing last year’s event because of her age. McLaughlin is an LA native although she now lives in Colorado Springs, Colo.